When winter dawned this year, I was facing it, for the first time, with the right equipment. A frame that I had picked out of a recycling bin in the Cove neighborhood of Stamford, some scrounged pedals, a seat post and a seat came together with the 26" Complete Ktrak Kit and created a vehicle that sneered expletives at every snowfall. As you can see from the photo, my snowbike isn't exactly tiny and is quite long. When I transported it with my homemade Honda Element bike rack I had to mount the fork to the center, which left the rear track to stick between the front seats for the whole trip to the Adirondacks and back. Now, for the first time, I had to put it away for the season and don't have an abundant amount of basement space. 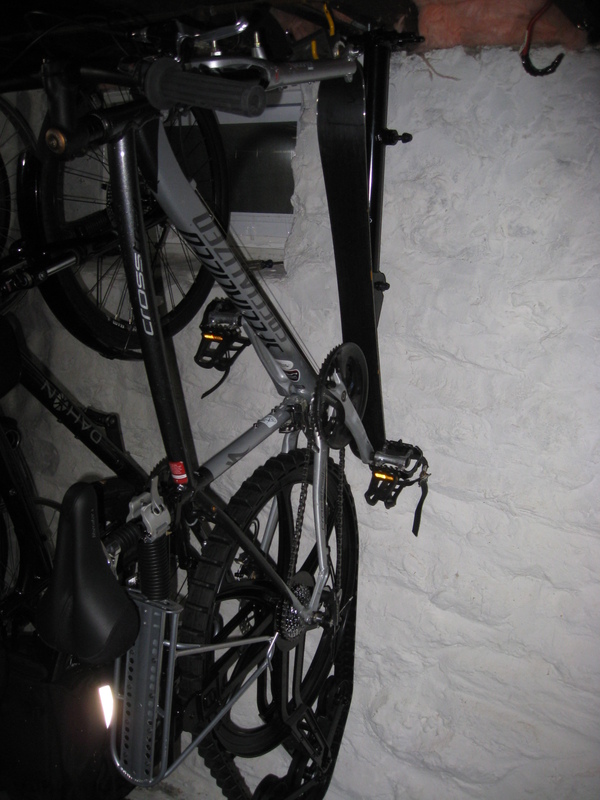 To store my more normal bikes I settled on a number of Crown Bolt Heavy-Duty Hangers (save for the recumbent which takes a slightly different one). 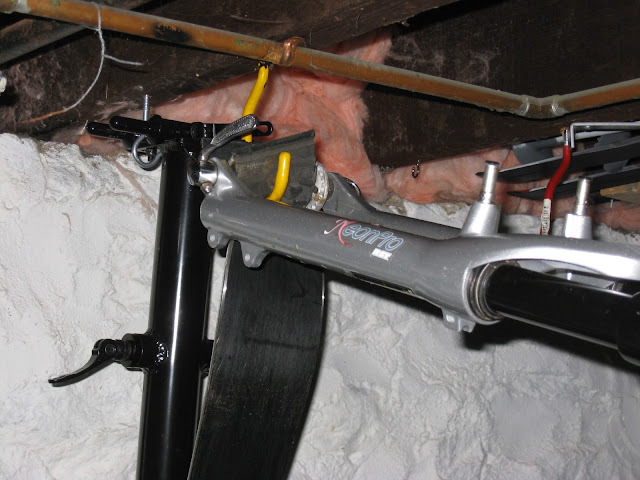 You simply drill a small hole in the rafter in the basement ceiling and gently hang the bike by the front wheel. I haven't had a water problem in the basement in years, but I've slept well with the thought that at least 8" of water would have to fill the basement for the bikes to be touched, and if 9" of water ever did get into the basement, I'd have bigger worries than the condition of my bicycles. Since the snowbike is so long with the ski attached, there's no way it would work on the hanger as it. 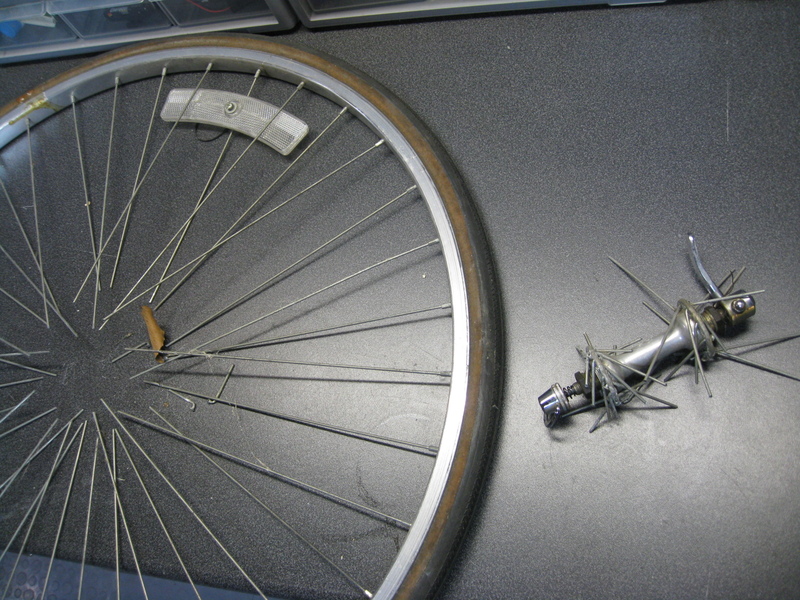 So I remembered the Fuji Espree from the first Saved From The Scrapheap post: I used the rear wheel for the recumbent, but I still had the useless front wheel. This gave me an idea. I had used bolt cutters before when I was first building the snowbike, and they once again came to my aid when the time came to put it away for the season. I liked that bolt cutters were bookending this project - much like the spinning license plate in Back to the Future I and III. It still works, obviously. When I removed the front ski and stuck it on the snowbike fork, the uneven basement floor tried to roll it away from my workbench. I then found a piece of mountain bike tire (unused) and cut it into a 3" length to cover it so it would stay put on the hook. 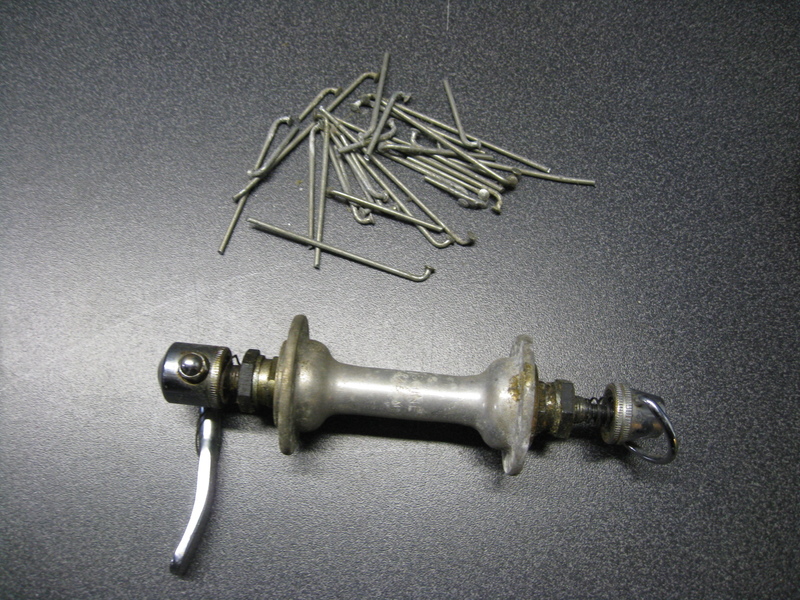 I found a smaller hook from which I hung the ski. When I was done, I truly realized that winter was over. So the snowbike has been put away. It hangs proudly next to my Dahon Matrix. a very nice share... do you have any tutorial video link about this? please share if any?